Originally a three-piece house band laying down sweet and sour improvised grooves for dinner guests at various Fortitude Valley establishments, a chance encounter with a live-to-air freestyle rap session on 4ZZZ introduced the band to the lyrical wizardry of Master Wolf. The EP’s opening track 'How We Jam' recounts the genesis of this collaboration. "I first heard Master Wolf freestyling on a radio program late one night and was blown away by his skill. I thought that what he was doing would really compliment what we were doing. I literally tracked down his number the next day and called him to see if he wanted to collaborate with us." reflects Brian L'Huillier (bass). 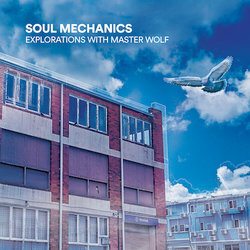 The foursome began playing live shows around Brisbane, letting things marinate on stage - Master Wolf freestyling over Soul Mechanics' deep groove improvisations - eventually, after recurring themes were reworked and re-imagined during live shows, four ideas stood out as worthy of recording. To try and capture the essence of the live experience, the band shacked up for a weekend in Dave Kemp's (drums) studio and, true to their ethos, the musical skeletons were jammed on, fleshed out and the results recorded and presented in this EP. No Hate is an instrumental track steeped in the world of Portishead-esque Trip Hop with its experimental and off-kilter mix of swirling synth textures, sinister sound effects and warped percussive noise.